Musing on the topic of sewing patterns and historical clothing research. One of the most memorable clothing exhibits I saw the Yves Saint Laurent retrospective at the Metropolitan Museum of Art in 1983. 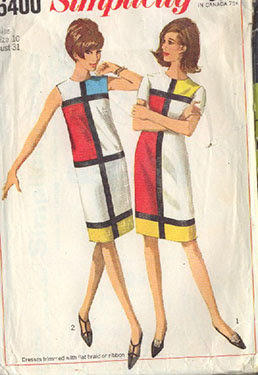 I clearly remember seeing the "Mondrian" day dress of 1965 there. 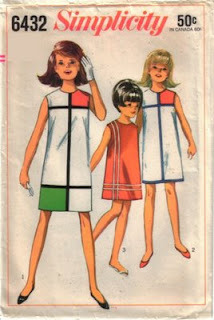 I am sure that there was a Vogue sewing pattern with a similar design. 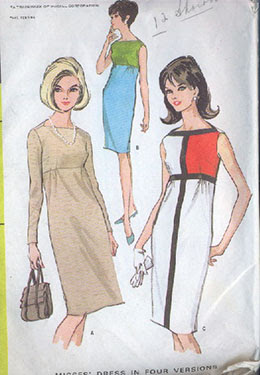 Here are two "copy cat" versions of that pattern from 1965-66. Do you want to make the pattern into your own fashion? 16 + years owner vintage sewing patterns company. 20+ historical clothing research.